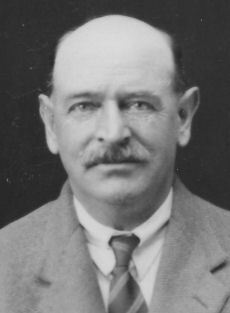 Charles James Weller was born in 1890 in Chailey, East Sussex and married Dorothy Shoesmith in 1920; they had seven children. He served in the Royal Sussex Regiment during the First World War and spent most of his working life with the London and Brighton South Coast Railway. He had the privilege to be the last Station Master of the Dyke Railway. 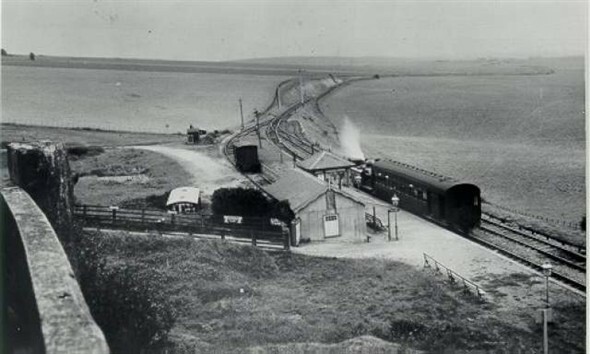 The Dyke Railway, which operated from Brighton to the Devil’s Dyke, opened on 1st September 1887 by the Brighton and Dyke Railway Company, it left the Shoreham line at Aldrington and ran past Brighton and Hove Golf Course, to a station at Devil’s Dyke Farm, some 200 feet below, and over half a mile from the Dyke Hotel. However, as the popularity of motoring increased and the masses were able to drive all the way to the hotel, the line lost its attraction. Regardless of a campaign by supporters to keep the line open, Southern Railway maintained that it had to close due to a lack of support. As a result, on Saturday 31st December 1938, after nine years in his post as Station Master, Charles Weller locked up the station and joined the 5.27pm train to Brighton station. Cheering passengers gave the train a great send off, but it was the end of an era. Charles Weller went on to work on Hove and Aldrington stations. What an interesting page! I’ve often looked out for the course of the old railway line as I’ve driven past. I bet it was a lovely journey (as long as the view wasn’t too obscured by cuttings). Wouldn’t it be great if the tracks were re-laid and the line opened up as a steam attraction? In 1962 I moved with my parents to 202 Poplar Avenue, a Council owned ground floor flat that is the second to last property on the left (south-west) before you get to Hangleton Way. The wall at the bottom of the rear garden of this and the flats on either side runs from south-east to north-west (at an angle of about 35 to 40 degrees) following the line of the old Dyke Railway. At that time the other side of the wall was still farm land but the railway line had previously been immediately on the other side of the wall. On very clear days we used to see the Isle of Wight from the kitchen and garden. Hangleton Way from there down to St Helen’s Church was still a dirt track (a mud track in winter!) with only two farm cottages on the western side of it. There were virtually no houses at all in Hangleton Valley, just those on either side of St Helen’s Green and Hangleton Manor was derelict. Other pages on this site cover the route of the Dyke Railway line from Aldrington Halt as far as this point, but from here the line continued along what is still today a walking path over the Downs, which you can access where the recycling bins are located opposite the end of Poplar Avenue. Various railway cuttings were in place when we used to walk along the path in the 1960s and I remember the Council’s dust carts going up there almost every day for a while to dump rubbish in a couple of big landfill holes in the ground, right in the middle of the track. I haven’t looked for a long time but until relatively recently what used to be the platform, seen in the picture above, was still in place as a lorry loading bay belonging to the Dyke Farm. It may still be there now, I’m not sure.